Kvelling about latkes....look, I'm practically a fluent Yiddish speaker! Amidst the cornucopia of Christmas related Holiday cheer, us Jews sit tight and wait patiently for our lovely little Festival of Lights celebration which is marked by the best traditional Jewish food of the year: latkes!! Translating to potato pancakes in English, latkes are traditionally made with shredded potato, flour and egg; then fried to crispy perfection to create a smooth crust for your condiment of choice: sour cream, applesauce, or ketchup. However, if you are a New York Jew, there is a pretty good chance you will not be spending your Hanukkah watching your kindled menorah in a backdrop of wintery snow, but rather on the beach at some sun-filled tropical destination. Consequently, your beach body might not be feeling piles of deep-fried potato right about now. 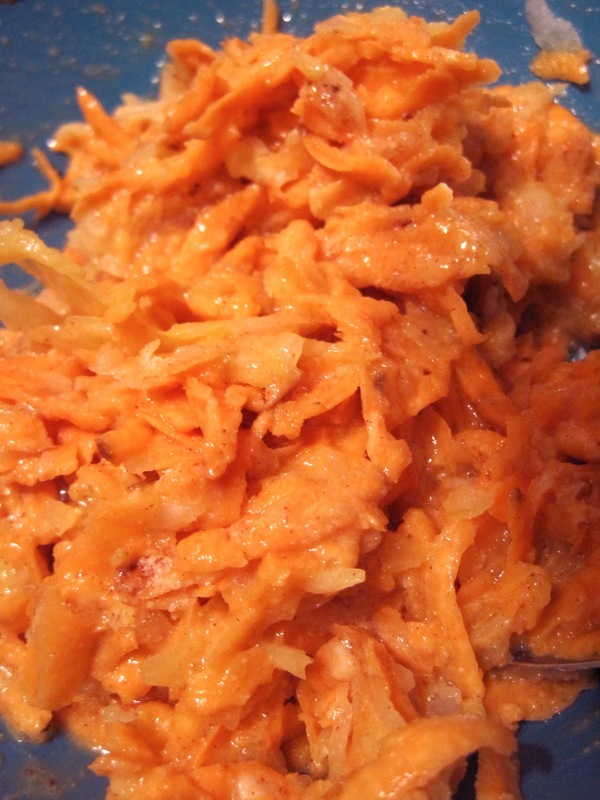 Which is why I present to you this Baked Sweet Potato Latkes recipe! Not only are these latkes infinitely healthier than your traditional type as they use nutrient-packed, beta-carotene full sweet potatoes, whole wheat flour, and minimal oil- if you've ever embarked on traditional latke making, you know they soak up oil like a sponge- but baking a large batch at one time saves the hassle and time of individual pan-frying. A dash of cinnamon and nutmeg enhance the sweetness of the potato, while the onion provides the perfect savory contrast. Plus, they retain the crisp, crunchy texture of your traditional potato pancake- the outside is just not as thick, which I actually enjoy. Preheat oven to 400°F. Spray a cookie sheet with nonstick spray or olive oil spritzer or use a silpat. Serve with light sour cream/applesauce and a dash of cinnamon and nutmeg, or ketchup.